We’ve heard a lot about troubles in the marketplace lending space over the last couple months. LendingClub, the industry bellwether, ousted its founder-CEO and revealed it is under federal investigation. Its stock has plummeted, contributing to a steep fall for shares of small business lender OnDeck. Add in layoffs at P2P rivals Prosper and Avant, a postponed IPO and litigation for consumer lender Elevate Credit, and a U.S. Treasury Department report hinting at a need for more regulation, and it’s clear why investor enthusiasm for marketplace lending would be diminishing. So where are things going? Funding activity has slowed in recent months, and private valuations look ripe for reductions. A key driver will be falling public market comps. At CrunchBase, we took a detailed look at U.S. companies in the marketplace and alternative lending space that have raised $20M or more in private investment. The analysis (see full chart below) shows a total of $3.9 billion in venture and growth-stage investments in the industry, the vast majority in the past three years. Companies raised an additional $2 billion in debt financing, also mostly in the past three years. Private valuations across the lending space, where available, showed marked appreciation in 2014 and 2015. SoFi, for instance, was valued at $3.5 billion as of July, up from about 1.4 billion in early 2015 and $400 million in early 2014. Those are post-money values, but the appreciation is well in excess of the sums invested. Avant showed a similar rise, with its post-money valuation doubling in less than a year. And Prosper more than doubled in less than a year, hitting a $1.8 billion valuation in April of last year. Alternative lending currently looks like the reverse of the standard VC model, in which private markets are where one builds a business, and public markets are where one gets a lucrative exit. LendingClub’s public valuation was recently around $1.75 billion, for instance. Its valuation among private investors seven months before its December, 2014 IPO was $3.5 billion. OnDeck’s pre-IPO valuation couldn’t be located. But considering that it raised $220 million before going public and its market cap was recently around $350 million, it’s clear private investors are seeing disappointing returns. That said, while we can expect down rounds near-term, it’s not clear VCs will lose their shirts in marketplace lending forays, particularly those who were mid- or early-stage investors. One reason is that venture and growth investors appear to be majority shareholders in alternative lending businesses, based on public filings by a few companies. 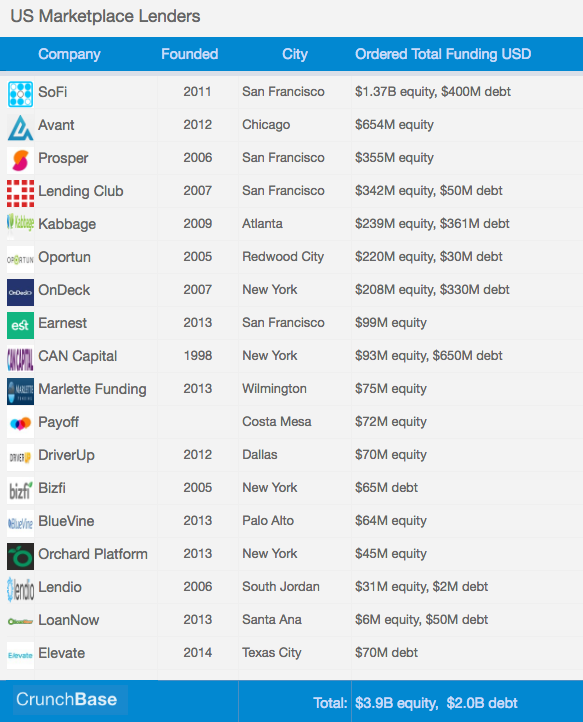 Just before LendingClub’s public offering, for instance, the company’s six largest VCs owned 63% of shares. At OnDeck, the seven largest VCs owned more than two-thirds of shares pre-IPO. High VC ownership levels mean that even a lackluster exit could return all or more of invested capital. Even after LendingClub’s stock plummet, for instance, VC’s post-IPO stakes would be worth more than the $392 in disclosed investments before going public.